4 AWG EPDM WELDING CABLE WITH A HIGH FLEXABILITY AND IS RATED FOR 600V,CAN BE USED AS LEADS FOR A WELDER OR BATTERY CABLES FOR MACHINERY. (ROHS COMPLIANCE) MADE IN USA. # 1 Awg Golf Cart Battery Cable Club car DS IQ HD SET 1 AWG WELDING CABLE WITH A HIGH FLEXABILITY AND IS RATED FOR 600V,CAN BE USED AS LEADS FOR A WELDER OR BATTERY CABLES FOR MACHINERY. (ROHS COMPLIANCE) MADE IN USA. 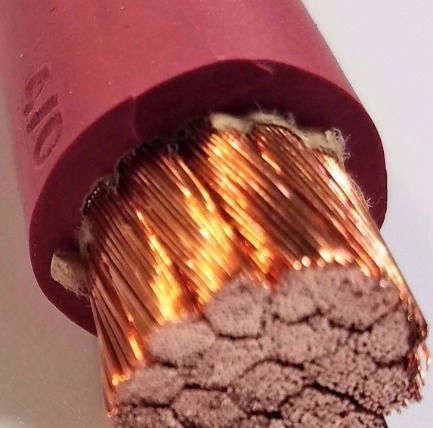 4 AWG EPDM WELDING CABLE WITH A HIGH FLEXABILITY AND IS RATED FOR 600V,CAN BE USED AS LEADS FOR A WELDER OR BATTERY CABLES FOR MACHINERY, SOLAR, CAR AUDIO. (ROHS COMPLIANCE) MADE IN USA. For 6P2C, 6P6C,8P-RJ45 use 2 AWG EPDM WELDING CABLE WITH A HIGH FLEXABILITY AND IS RATED FOR 600V,CAN BE USED AS LEADS FOR A WELDER OR BATTERY CABLES FOR MACHINERY. (ROHS COMPLIANCE) MADE IN USA.